This document discusses how you can use Visual FoxPro COM objects in your Active Server Applications. COM is the primary mechanism employed by ASP to extend the base functionality provided by this popular Web development tool. Active Server Pages is Microsoft's primary architecture for building Web backend logic. The concept of ASP is based on a scripting metaphor that allows users to mix HTML with scripted code in the same document to provide dynamic Web content. Scripting is not a new concept from Microsoft – tools like Cold Fusion and even script languages like Perl preceeded ASP many years before Microsoft even considered the Web platform. However, with ASP Microsoft has legitimized the concept of scripting with an environment that closely ties into Microsoft's general Windows system architecture and COM. One misconception about ASP is that it's 'way beyond CGI and ISAPI' and other low level interfaces. The truth is that ASP is really just a specific implementation of ISAPI in this case that hides the complexity of the underlying protocols and system interfaces. The Active Server Pages engine is implemented as a script mapped ISAPI server extension. The driving engine—ASP.dll—is an ISAPI extension that is called whenever someone accesses a page with an .ASP extension. A script map in the server's metabase (or registry settings on IIS 3) causes the ASP script to be redirected to this DLL. Script maps are meant to give the impression that the developer or user is "executing" the .ASP page directly, but in reality ASP.dll is invoked for each .ASP file. ASP.dll hosts the VBScript or JScript interpreter and HTML parser, which in turn parses the ASP pages, expanding any code inside the page and converting it to HTTP-compliant output to return to the Web server. The figure below shows how the architecture is put together. The script code can use any feature that the scripting language supports. One important feature of the engine is its ability to support COM objects. ASP starts up with several built-in COM objects that are always available to you in your ASP pages. The Request and Response objects handle retrieving input and sending output for the active Web page. The Server object provides an interface to system services, the most important of which is the ability to launch COM objects. The Session and Application objects provide state management to allow creation of persistent data that has a lifetime of the application or of a user's session, respectively. The figure also shows Active Data Objects. Although ADO is not an intrinsic component of ASP that must be explicitly created with Server.CreateObject(), it is so closely related to ASP that it should be listed here. ADO is used to access any system data source (system DSN or OLE DB provider) on your system through familiar SQL connection and execution syntax. Finally, you can load any COM object available on the local system. But there are some limitations: The object must support the IDispatch interface and late binding in order to be used by ASP, but that's hardly a limitation since most objects support the dual interface standard. All COM objects built with Visual FoxPro or Visual Basic support this interface. 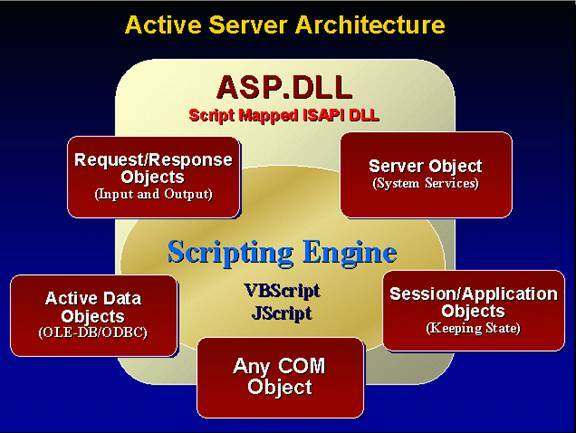 Notice that the ISAPI DLL is the actual host of the scripting engine. ASP.dll is hosted in the IIS process and the scripting engine, and any in-process COM objects launched from it also run inside this process. This is an important fact—since components run inside of IIS they have the potential to crash or hang the Web server on failure. Moreover, component development can be very tricky because components running inside IIS can be difficult or impossible to debug at runtime. I don't want to go into great detail here, but I'll briefly discuss the base ASP syntax for review here. ASP scripting works via markup tags that are embedded directly inside of an ASP document, which is nothing more than a text file. The ASP engine reads the ASP page and parses the code inside of the page, expanding any expressions or code blocks into plain HTTP/HTML output. The result from an ASP page is always plain HTTP/HTML output that contains the expanded output of each script expression in the document. As such, the resulting output can run on any Web browser assuming the author used HTML markup that is compatible on each browser. ASP scripting is deceptively simple and that's really the purpose behind a scripting engine. The limitations of a scripting engine really lie with the scripting languages and the syntax that they support. You'll find all of the basics in VBScript and Jscript, but these languages are very plain. The real power of ASP lies in its ability to hook into COM and extend the scripting interface with both internal and external objects. Handles all input from HTML forms, the Web server and the browser. The Request object is responsible for providing the information you need to create queries or act on requests. The Request object provides a number of collection objects you can access, which include Form, QueryString, ServerVariables and cookies. This object is the counterpart to the Request object that is responsible for dynamic output. The basic method is Response.Write(), which allows dynamic creation of text output to an HTML document that gets sent back to the server and then the browser. With this object you can control direct output as well as the HTTP header, including cookies and special features such as redirection and authentication. Active Data Objects is an external object that you can use to access any ODBC or OLE DB data source. This object must be explicitly created with SERVER.CREATEOBJECT("ADODB.Connection") and/or ADODB.RecordSet. The Server object provides an interface to system services. The most important aspect of the Server object is its ability to instantiate external COM objects including Visual FoxPro Automation servers. These two powerful objects allow you to manage state between individual requests. By its nature, HTTP requests are stateless, meaning the current request knows nothing about the previous request unless you pass the relevant data to it. These objects allow attachment of external property values to dynamic objects so you can create persistent variables that are available for the duration of a user's connection or an approximation of "global" variables via the Application object. These objects are crucial to making ASP work by providing the interface to the Web server allowing to read input, send output and manage state and the system. If you've looked at Active Server Pages, you're probably familiar with using the scripting features of ASP and accessing database data directly using the Active Data Objects (ADO). Direct database access provides the easiest way to get at FoxPro or other ODBC/OleDb data quickly. But there are some rather serious issues with ASP scripting that come down to the limitations of the scripting model and the limited support for error handling. These issues make it relatively hard to build mission-critical, bulletproof code with scripting alone. Furthermore, the scripting nature that mixes code and HTML can easily lead to heinous spaghetti code that's hard to debug and even harder to fix a few months after the application goes live. Doing everything in script code violates a fundamental rule of good application design: Separate the user interface from the data access code. While it's possible to do all these things with scripting code, the environment does not encourage it. Scripting requires you to maintain strict discipline, which may result in bypassing many of the conveniences that make ASP such an attractive solution in the first place. Finally, script code is interpreted at runtime and very slow – even when compared to a non-compiled language like Visual FoxPro. Running similar looping and parsing code and even ADO recordset loops can run as much as a hundred times faster in VFP than in an ASP page! According to Microsoft scripting was never meant to be the end-all development environment – rather the scripting engine was designed as a gateway to interface with databases via ADO and the use of COM for providing the business layer. Microsoft has long realized that no development tool is an island, and thus should be extensible. Active Server Pages is no different. With ASP you have the ability to create any Automation-capable (IDispatch-compatible) COM object using the Server.CreateObject() method. Once that object has been created, you can access its methods and properties the same way you can in Visual FoxPro, Visual Basic or any other Automation-capable client. COM is everywhere in Active Server Pages. The entire environment is built on COM. All the built-in objects – Request, Response, Session, Application and Server - are COM objects that are exposed with public scope to your ASP pages. ADO which you use for database access with ASP is implemented as a COM object that you actually have to create with Server.CreateObject() like any other COM object. Even the scripting engine is a COM object with a specific interface that can be extended and allows for custom implementations that can provide their own syntax (like a third party Perl engine for example). What's even more important is ASP's ability to create any COM object and use it from within the script code of the page. It's very easy to create a VFP COM object and take advantage of Visual FoxPro's powerful language and fast database access to provide functionality that would be hard or slow to implement with ASP script code. It also allows you to partition off business logic into a middle tier rather than creating spaghetti code at the ASP script level. COM is a very powerful extension for ASP, but you should also realize that its use will make ASP application dramatically more complex from an administrative point of view. No longer do you deal simply with text documents that you can upload and replace on a server. No longer can you easily debug your applications or even simply stop and restart it. COM objects must be installed and maintained on the server and IIS makes this process far from trivial when it comes to updating these components in a live environment. More on this later in the article. Let's start with a very simple COM example that you might also find useful. I'm sure you've seen the counters in use by many Web sites. I'll implement one with Visual FoxPro by creating a COM object that counts up hits in a database file. In this example, ASP is used to handle all the HTML and Web-related tasks while VFP provides the business logic of managing and incrementing the counter. *** Function: Set the server's environment. VERY IMPORTANT! *** If you use a SQL backend use this to prevent login dialogs! *** Utility routines like GetAppStartPath etc. *** Function: Increments a counter in the registry. *** -1 delete the counter. *** you can read from the ASP page to check for errors. THIS.cErrorMsg=THIS.cErrorMsg + "<BR>Error No: " + STR(nError) + "<BR> Method: " + cMethod + "<BR> LineNo: " +STR(nLine) + "<BR> Message: "+ message() + Message(1) + "<HR>"
When this code runs for the first time, a table named WebCounters is created. Any new counter value that is specified causes a new record to be added to this table. So a record with the ID of Homepage is created and the value is increased by one. On each successive hit, the counter is simply incremented by locating the record pointer on the specific counter record and updating the value. Because it's a VFP table that holds the data the value is automatically synchronized through VFP's record locking mechanism – if two users try to access the page exactly at the same time VFP's record locking and the SET REPROCESS setting cause one of the requests to be forced to wait for the record lock to clear. The class above is very basic, but it includes some very important features that you should implement in every server that you create. First, take a look at the Init method of the class. It's used for setting the VFP and application environment. It's crucial at this point that you set all settings that you expect your server to have. Most importantly, you want to turn off EXCLUSIVE access on startup or you'll run into problems when multiple instances of your server try to access data files simultaneously. Remember that ASP is multi-threaded so multiple requests may be running concurrently accessing the same data files! This is probably the most common error that hangs servers! It's a good idea to turn off the resource file for the same reason. Any environment settings you expect to be in place should also be set at this time. SET DELETED, SET REPROCESS and SET EXACT are a couple that I always set. Keep in mind that a DLL object cannot have any user interface. This means it's not legal to have a dialog of any kind popping up. This means file open dialogs, SQL Server login dialogs, code page dialogs, print dialogs as well as any modal state in your code. Using SYS(2335,0) forces the server into unattended mode causing a trappable error to occur on any use of user interface operations (actually, this is not required for DLL servers as this is the default, but it's a good idea to include anyway in case you build your object as an EXE server at some time). When you load a server from an ASP you should also realize that the server loads your object when the page is accessed, then unloads the server when the page is done. This means your object is recreated on every hit to the ASP page. This means that Init() and Destroy() of your server also fire on every hit. Hence, you want to try to minimize the amount of code that runs in these methods to optimize performance. This basically means you should design stateless servers that don't require extensive construction and property settings set via code. Use common default values so you don't have to externally set property values either via Init() code or property settings over the ASP COM interface, which is also comparatively slow. Your server should also contain an error handler. This is vital, because any error that occurs will hang your server to the point that you'll have to kill the process (if it's an EXE server) or the client process (if it's a DLL server – in this case IIS) in order to clear the server of the error. By trapping the error you prevent this tragic end of your server's life in most circumstances. This is a great debugging tool when your server has problems. You can conditionally include this code after something didn't work and check the error message for the problem in terms of VFP error messages. Keep in mind that the error handler above simply ignores errors that occur – the code continues to run through the rest of the method that is running. Variations on this scheme include using VFP's COMRETURNERROR() to immediately cause an exception in the ASP client code to be displayed as a a standard ASP error, or to use RETURN TO (StartMethod) to shortcut the currently executing code to an entry code handler where the error can be manually handled and presented properly. In either case Error handling is crucial to keep your server from hanging. ¨ Build your components modular so that they can be tested outside of the COM environment. This includes using smart parameters rather than extensively relying on passing objects that may not exist during the debugging phase. ¨ Test your components inside of VFP. Since COM objects are really VFP class instances use the classes natively from a VFP test program. At this point you have the chance to debug the class methods with help of the VFP environment using the debugger to catch and step through problem code. ¨ Once things run OK, build the COM Server and then re-test the classes using COM. It's still easier to debug a bonked COM object in VFP than it is in ASP, since VFP doesn't lock COM objects into memory. ¨ Now you're ready to try your component under ASP. ¨ If it runs without problems – great! If not, read on to find out how update your COM components on the server. Unfortunately, the debugging process for ASP components is far from trivial. Remember at the beginning of this paper I mentioned that the ASP development is fairly simple, but as soon as COM is thrown into the mix the complexity goes way up. Here's why! 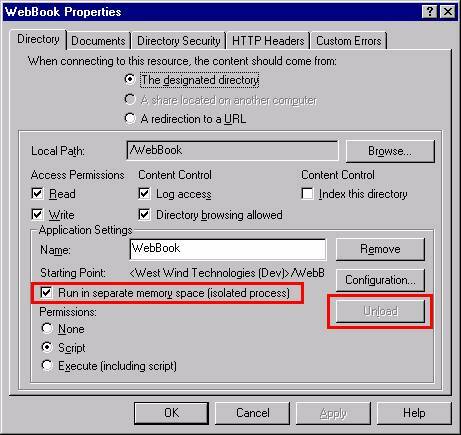 ASP COM components get loaded into the IIS process space and are locked into memory. This means that even though ASP loads and unloads your component on each page (Init and Destroy fire in your object), IIS permanently locks the DLL into memory. IIS does this as a caching mechanism that improves performance of the object. For VFP/VB this provides great gains because the runtime libraries load only once and stay loaded in the IIS process after that. The flip side is that once you've loaded your COM object, it will never unload until the Web server is shut down or the ASP application is released. There's no programmatic way to do this, and the process to unload IIS or an IIS Virtual application requires a number of manual steps (which you get used to in a hurry). IISRESET has a number of options that allow you to stop or start or restart all the configured Web Services which includes if set up WEB, FTP, SMTP and the News Service. In other words all the service depending on the IISAdmin service. Kill is a utility from the NT resource kit that will kill any process dead in its tracks. It's the quickest way to shut down IIS completely. Note that after killing the process you need to wait about 5-10 seconds or so before you can restart it. This is because the NT Service Manager polls running services and if it hasn't updated the status of the service as Not Running it will not restart it. The Pause in the batch file takes care of this, but you do have to press a key to make it happen (or you can use a third party DOS timed wait program). I don't recommend you do this with a production server, but it works great for a development box. BTW, if IIS is hung and will not shut down via the service manager this same batch file will shut down and restart your server! It's a handy routine to have available. but this will take a while and is not a good idea for development. It also relies on the service manager, so if IIS is hopelessly hung this will not shut it down. From this point on any request that uses this virtual directory and any directories below it belong to this application. Any ASP page loaded from there run in this 'protected' application in an MTS package (NT) or COM+ Application (Windows 2000) and load their COM objects into the MTS/COM+ process of this application rather than into the IIS process. The latter can be accomplished by clicking on the Unload button in the dialog above. You can also unload the application from the MTS/COM+ Management console by selecting the virtual application and using the Unload option from there. The result is that only this application unloads and with it all those COM objects that may have been loaded of ASP pages from this virtual application! ¨ Virtual applications are slower than default applications because there's overhead in the passthrough from IIS to the MTS/COM+ process. ¨ In online environments the Unload option is of very limited value because Unload does not guarantee that servers stay unloaded. As soon as somebody hits a page with a COM object the object once again becomes locked. On busy sites it would be next to impossible to update a component quickly enough. The only safe way to update components is to shut down the Web server! As you can see, the only reliable way to update components on IIS is by shutting down the Web server. This is a very serious issue if you think about it. Every time a code change is made you'll have to shut down the server to do this. Now think of the scenario of a big time E-Commerce site that's constantly busy – an update of a server could take a few minutes to get done right. You have to shut down the server (and you would not want to use KILL in this case! ), then copy in your new component, re-register it (this may not be necessary, but to be safe you should), then restart the Web service. This is a lot of time and a large number of pissed off customers who get a message that the server is not available for even a few minutes. I know of no workaround for this issue, although I've thought about this quite a bit in my own Web Connection framework, where remote code updates can unload objects, replace the server, then automatically restart as part of the Web interface. IIS is in desperate need of a similar mechanism – let's hope Microsoft figures this out at some point (and they have with ASP+ and .Net where objects are cached and can be replaced inline). COM objects are very susceptible to IIS's security environment. The primary reason for this is that a COM object loaded from an ASP page inherits IIS's security context, which typically is the anonymous Web user accessing the page. The Anonymous Web user account by default is named IUSR_MachineName where machine name is the name of your server (du-uh!). The account name is configurable in the IIS Management Console, but it's recommended that you leave the account set for compatibility reasons (some applications may rely on the IUSR_ account). If you're running in a virtual application that runs in an isolated memory space the user account for this application will be IWAM_ plus some unique ID which you can look up in the security properties of the site. Under Windows 2000 an additional user called IWAM_MachineName also exists for Pooled applications. Pooled application share a single COM+ application that runs out of process of IIS. This provides isolation but better performance than private applications. What this is means is that your component is called under the IUSR_ or IWAM_ security context rather than under the Interactive User account which is what you use when you're logged on to the NT box (which in turn maps to your actual user account). IUSR_ is a very low security account that has next to no rights on the machine. All file access rights it possesses must be manually assigned! IIS does this automatically for any Web enabled directories, but for any other directories that may contain data or other support files you're responsible for configuring the file access rights! You'll probably want to set these rights at the directory level. Notice that this is a potentially serious security risk as this gains the anonymous user access to your server's hard disk, given that the user knows where to look for the data. Read access is all that's needed to high-jack a file from the server! Be very careful with security!!! You'll find that the username displays "IUSR_MachineName" (or possibly "WAM_USR_APP1" or something like that if you created a "separate application"). Now try the following (this will work only if you're running NT with NTFS—make sure you note the permissions on the file before changing them): Open Windows Explorer, select the COMCounter.asp file and change the permissions on it, so that only your user account has access to it. In my case I'll remove IUSR_, Everyone and also Administrator (because my development IUSR_ account has admin rights). So now only my current user account has access to this file. Rerun the request. Now when you try to access the page you'll be presented with a password dialog box asking for username and password. Type in your account info and look at the username returned by the ASP page: It's the username you logged in as in the password dialog—in my case rstrahl. Once you've tested this, make sure you reset the permission for IUSR_ and Everyone (if it was there before). This demonstrates how IIS passes down security to your COM object. The good news is that the security of the ASP page determines how your server is accessed. The bad news is that the security of the ASP page determines how your server is accessed! Here's why it's a problem: Normally the IUSR_ account is meant to be a low-impact, user account that has practically no rights other than to read and execute Web pages and scripts on your site. When your COM object gets called from the Web, it usually will load under the IUSR_MachineName account, which by default will not have rights to read and write data in your application path! No files outside of the Web space can be accessed unless permissions are changed! ¨ Give directory access to the IUSR_ account. Assign full access rights to the IUSR_ account for every directory in which you'd expect to write data. This is tedious and prone to many errors because the directory permissions must be configured on every machine that you move files to. You also need to remember that this may include the system TEMP path and the SYSTEM path in order to make Windows API calls! It also opens up your system to serious security issues. This option is not recommended. ¨ Give the IUSR_ account additional rights. You can add the IUSR_ account to the Administrator group, and all your COM objects will magically have access to the system! Sure, but so will anybody else who accesses your system over the Web. If they can find a way into a directory (via Web Mapping, or whatever) the system is open to them. This may be a bad idea for a production system, but it's probably the best way to work on your development system—just be sure to test with the Admin rights off before you take your application online! ¨ Use Microsoft Transaction Server/COM+ for your COM object. MTS/COM+ allows you to configure a security role for your COM component, and by running through MTS you're allowing MTS to manage the security context for you. By doing so, you're changing the security only for the component—not the entire Web site. This is a decent way to implement security, but it complicates both installation and development of applications. Use this only as a deployment solution. ¨ Impersonate a user account from within your COM object. NT supports a concept called user impersonation, which allows you to temporarily change the user context to another user and then reset it to the original. In fact, this is how IIS itself handles user contexts such as IUSR_ that it passes to you. Setting user accounts is complex and requires usernames and passwords, which is unsuitable for generic applications. However, knowing how IIS creates user accounts can help here: IIS is a service so it runs under the SYSTEM account, but it impersonates the Web user to become whatever user is logged in. An API function called RevertToSelf()strips off all impersonations. When you do this to a Web request in your COM object, the server reverts to the SYSTEM account, which typically does have rights in most places on your system unless it was explicitly disabled. which demonstrates that an anonymous user comes in as IUSR_RAS_NOTE, then the IIS Impersonation is removed with RevertToSelf() and switches to SYSTEM. (Note: If you're logged into the Web server somehow, like through VID debug mode, your user account might show up instead of SYSTEM). The last call is in there to demonstrate that once you've changed the user context it doesn't change back for each method call but is scoped to the current page. There is no easy way to reset it back to IUSR_ unless you know the password. Generally this should not be a problem. What does this mean? Since IUSR_ is not supposed to have any rights, you can run into problems with accessing data in paths where IUSR_ doesn't have rights. When running your COM components, you can use RevertToSelf() to essentially grant the user temporary rights while you're executing the current ASP page. So once you've reverted to the SYSTEM or specific user account, the user has rights to access the system as needed, be it for data or the registry or a network resource. Once the page completes, the lax security is released and reverts back to IUSR_ on the next access to the Web server. Keep in mind that the SYSTEM account is a local account and it has no network rights. It most likely will not have access to remote machine drives across the network. If that's required, you might have to set up a specific account to impersonate and use it for remote access, or else use the Transaction Server mechanism mentioned in the bullet list above. I've detoured a little here digging into ASP infrastructure that explains how things go wrong. The counter example above was a very simple example how you can use a COM component that provides specific data like a business object to an ASP page. You directly interface with the object from the ASP page and let the component do it's piece of work – in this case manage and increment the counter value. In this scenario you simply use the business logic in the COM object by accessing properties and methods of the component. This is the most common use of COM objects in general. This would be all that's required from the ASP page if the CreateHTML method returns a full HTML document. The same approach can be used for creating portions of HTML pages, like data-driven tables or things like Fox forms rendered as DHTML. This can be very useful for taking advantage of VFP's strengths and superior performance. Generating HTML in VFP can be drastically more efficient than using ASP script code as well as providing features that would be impossible to achieve in ASP altogether. It's also possible to use a COM object to return another COM object, even one that's not explicitly defined. In its simplest form you can do things like retrieve a record in VFP then return that record to ASP as an object. 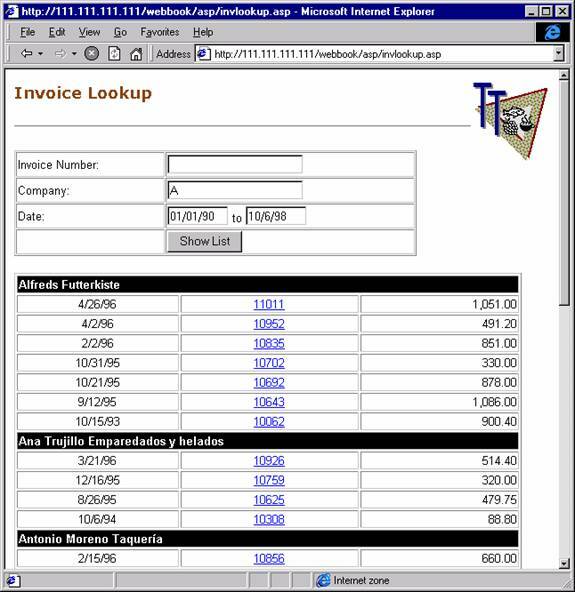 You can also create a business object that accesses data and contains other logic and pass that back to ASP, allowing the ASP page to drive that business object that was created on the fly in FoxPro code. We've already seen an example of the first scenario. Let's take a quick look at the HTML generating scenario. Physically this approach is no different from using method calls and properties directly, but conceptually it's changing the role of the VFP server into an HTML-generation tool in addition to processing the business logic. lcWhere = " AND Company = THIS.cCompany "
lcWhere = lcWhere + " AND orders.order_id = PADL('" +THIS.cInvNo + "',6) "
The form acts as both an input and output form. The difference here is that Visual FoxPro is used to do all data access, as well as providing the majority of the HTML generation for the table list below. The key code is in the last five lines of the ASP page, which populates the query properties and then calls the Custlist() method to render the HTML, which is returned as a string. You might be telling yourself, "This is some ugly code," since it's generating HTML manually via code. It might not be very easy to type this stuff, but it's actually very fast and efficient code compared to scripted ASP code. For one thing there's no COM access involved here for each field access – a lot of overhead is involved in making COM calls for every data access of ADO recordsets. For large tables you may see a 10 times or better performance increase. *** Function: Renders the current select cursor/table as HTML. *** sends directly to output. *** Return: "" or output if llNooutput = .t. lcOutput = lcOutput + "<tr>"
lcOutput = lcOutput + "<th BGCOLOR=#FFFFCC>"+lcFieldName+"</th>"
lcOutput = lcOutput + "</td></tr>"
lcOutput = lcOutput + "<TD>" + STRTRAN(lvValue,CHR(13),"<BR>") + "</TD>"
lcOutput = lcOutput + "<TD>" + TRANSFORM(lvValue) + "</TD>"
The order list in the example above can get very long—the VFP demo data contains more than 1000 records. One problem that you run into is how to display all that data at once. Surprisingly, getting the data and generating HTML is relatively fast—what's really slow is the table rendering inside the browser. HTML tables in IE don't display until all data for that table has been retrieved, including the final </table> tag. This means the entire set of data needs to download and then IE must recalculate the table widths and render it. When you run the ASP table, you'll find that the table is not available for 10 to 20 seconds (on my P200 notebook). To speed things up, there's a little trick you can use: Rather than rendering the entire output as one huge table, the Fox code above creates each row as its own table. The tables stack on top of each other, and if you remove the borders from the tables you can't tell the difference. Now the table starts rendering immediately as soon as any data is returned, even while it's downloading the remainder of the data. The apparent performance of the INVLookup.asp page and the COMINVLookup.asp are like night and day. Note that you can do the same thing to the ASP-only code as well. But even then the VPF code performs notably better than the scripted ASP page. Besides performance, you get the advantage of the flexibility of VFP code. If you need to perform complex conditional logic or run a lot of separate queries and subqueries, creating HTML in Visual FoxPro may be a smart solution. On the downside VFP HTML generation means that you have to recompile your server in order to change the visual aspects of the generated code. This looks kind of funky, but it's the right way to access the Form object and one of its collection values. The Form collection is the default property for the Request object, and the Item() method is the default method for the Form collection, which makes Request("FormVar") work in VBScript. In Visual FoxPro you always need to use the longhand to make this work. Knowing this, you can now access all of the other Request object collections, although each of them has a slightly different implementation object model (consistency has never been one of Microsoft's strengths). I also pass a Session object—you can use its Value() method to retrieve and set any session values that you stored in an object. The same goes for the ASP Application object. Notice the inconsistency here with a Value() method rather than an Item(). The Response object is a little easier to deal with. All you have to do is call the Write method to send output directly into the ASP output stream. Note that it's much more efficient to write to the Response object once with a single large string rather than sending a lot of small strings in a loop, since each call to the Response object is a COM method call. You've now seen how to access the Request and Response objects by passing parameters to a COM object method. There is another way to make these two objects, as well as ASP's Session, Application and Server objects, available to your servers automatically. This interface's main purpose is to give you hooks at the beginning and end of a page to perform cleanups and to make it easier to get access to the various objects that ASP exposes. Keep in mind, though, that you cannot use any of the client object's methods in the OnStartPage() and OnEndPage() "events" because they're not properly initialized in these methods. All access to these objects must occur only in your actual request methods, such as EchoBrowser() in the class above. The main use of this interface is that it you don't have to pass the various ASP intrinsic objects down from the ASP page to keep your parameter interface clean. To get similar functionality as with the IScriptingContext interface you can call this code in the Init of the class and then assign the oScriptingContext property to the oContext object retrieved for easy access. It's important to understand that this interface works only if you're running your Web Application (virtual or root) in Medium or High isolation modes that run through the COM+ manager. If you run in Low Isolation mode GetObjectContext() will fail. Note that functionally there's little difference between these two interfaces in classic ASP. However in ASP.NET I've not been able to get the IScriptingContext interface to work, while the ObjectContext object access works fine as long as the ASPCOMPAT page directive is set to force IIS to create the objects. It's easy to pass objects to your Visual FoxPro server, but it also works the other way around: You can create objects in Visual FoxPro and pass them back to an ASP page. Objects can be nested, so you can create a VFP object that contains other member objects, and you can reference those objects and its methods from ASP as well. Powerful, don't you think? Let's look at a simple example that allows browsing, editing and adding to a customer list—all using a single ASP page and three separate methods of a VFP Automation Server. The figure belowshows the simple form. Everything happens on a single ASP page, which can run in three modes: Default View, Customer View or Save Mode. Customer View occurs when you click on a company hot link, which retrieves the customer information and fills the individual fields above the list with the customer values. Saving occurs when you click the Save button, which causes the ASP page to run with a Querystring of ASPObjects.asp?Action=Save. The Save flag is used by the page to decide whether to update or add a new object. Notice the retrieval of the "Action" form variable, which is responsible for routing calls to the appropriate server method. There's also a hidden CustNo form variable that lets the server know which customer to save when the user clicks the Save button. Although the form variable is hidden, it does appear in the Request object. *** ref to the customer. lcOutput = "<b>" + TRIM(Company) + " has been saved...</b><br>"
*** cursor with a single command! Notice how little code is involved in making this work, and how the HTML display logic and the business logic has been, for the most part, separated: The ASP page has the HTML display logic and the VFP COM object has the business rules. Compare this version of HTMLCustList with the version used in the previous section where the HTML was built by hand. Here I use a generic method called ShowCursor() described above, which can render any cursor as an HTML table with this single line of code. Methods like this can make very short work of creating results. The key concept to walk away with from this exercise is that it's easy to have Visual FoxPro and Active Server Pages communicate with each other using business objects that you can create or may have already created with Visual FoxPro. Each of these scenarios returns output other than HTML to the client. HTTP makes it possible to return any kind of data although the most common use certainly has been HTML output. Active Server Pages supports sending binary output to the Web server by using the the Response.BinaryWrite() method. Typically output written by ASP is written using double byte character sets which are native to COM. When you simply use the Write Method to output binary data you actually get the original text as Unicode output sent back to the server. Write will also stop output when it encounters a NULL (CHR(0)) character in the output stream. This will obviously break any binary data that you may want to send. The BinaryWrite method gets around these issues by marking the input string value for binary representation (a COM ByteArray to be exact) and the data is sent unaltered instead of being run through the COM string conversions first. So far, so good. Unfortunately, this doesn't work directly with VFP data. The problem is that COM servers created with VFP don't support explicit types – all return values from a method call are treated as a Variant type. When an ASP page retrieves this Variant it has to convert that Variant into a string first at which time any binary data is again converted to Unicode first. LcBinaryData = "This is a test" + CHR(0) + "More text…"
The square characters are the second Unicode character (0 in this case). Notice also that the string is truncated at the NULL rather than including the entire value. The same logic applies here: The data from the VFP server is returned as a Variant and then converted back into a Unicode string which fails with the same results. And voila binary data output is available. Note that this is a very simplified example. If your file contains data from a memo field you obviously have to work a little harder to get the data packaged since memo fields require a second file (DBF/FPT). My Distributed Internet Applications article describes how to efficiently package data for transfer over the Web. In addition to the powerful functionality of passing generic objects back and forth, you can also pass data directly by using Active Data Objects! To demonstrate, I'll show an example that accesses a SQL Server database and passes the data to your VFP server. You can, of course, do this directly from ASP using ADO and then looping through the recordset or using action operation to update the data directly from ASP code. Let's do something a little different—open the SQL Server Pubs Author table as a cursor instead, pass it to the VFP Active Server Component and add a record to it within the VFP code. To do this, set up a System DSN to the SQL Server Pubs database and name it Pubs. You might also have to set up some additional default values for the Authors table in order to allow inserts with only a few fields filled in, as I did in the figure below. lcOutput = "<table border=1 bgcolor=#eeeeee width=80% >"
lcOutput = lcOutput + "</table>"
This simple method adds a new record and populates the fields. Note the use of the Request object to retrieve the previous link that led to the current link. (If you try this on your own, this value will be blank unless you arrived at the test page from a link.) This is probably not a good use of passing a recordset because nothing useful really happens in this request—you could just as easily do this without the COM method call from the ASP page. But you could, of course, run extensive Visual FoxPro code prior to actually inserting the record into the ADO result set, which is where the power comes in. You could run your own query against local VFP data and then update the ADO cursor for return to the ASP page, which might do something further with the data. Or you could run a query in the ASP page to prepare the data and then pass it to Visual FoxPro to properly format certain columns of the result. It's easy to do by accessing the ADO object directly. In iterative situations, using the Response object directly in your VFP methods or passing back a complete string with the result output from VFP can be vastly more efficient than constantly creating and deleting objects over COM. Weigh convenience versus performance, and test different scenarios if you feel your request is slow. Keep in mind that there are a number of options available to accomplish the same job, and performance between approaches can vary considerably. With COM in particular, the performance rules aren't always cut and dried—what works well in one request may perform horribly in another. As you've just seen, it's easy to extend ASP with your own Visual FoxPro COM objects. When you're testing you'll see that your server code performance is very fast—operations run at native Visual FoxPro speed, so data access in particular is fast; it's noticeably faster, in fact, than using ADO with the Visual FoxPro ODBC driver for similar requests. Also, looping and string operations in VFP are vastly faster than they are in script code. The performance gain from using a COM object are very obvious by comparison. What is Apartment Model Threading and why should you care? Apartment model threading works by allowing multiple, simultaneous instances of your component to be created on separate threads. The operation is transparent and the logistics for the threading model are built into the Windows COM subsystem, with Visual FoxPro 6.0 complying to the apartment-thread model. Although COM makes it possible through this mechanism to run your COM servers as multi-threaded objects that can operate simultaneously, your program has little control over the multi-threading environment. In other words, the system controls the threading model and your application behaves just as a stand-alone application running in a multi-user environment. Apartment model threading provides a simulation of multi-threading, but does not really make an application truly multi-threaded and reentrant at the binary level as a C++ program. Apartment Model threading is fully supported only with VFP 6.0 SP3 and later. If you're building ASP COM components make sure you install SP3 and always build your COM components to the MTDLL runtime (using the BUILD MTDLL command). To take advantage of apartment model threading, simply create an in-process component (build a COM multi-threaded DLL in the Project Manager, making sure each OLEPUBLIC class is marked for multi-use operation!) and then instantiate your component via CreateObject() or an equivalent function call from any COM-compliant client. If the client is multi-threaded it can take advantage of the scheduling magic that COM performs to allow your server to be called on multiple, simultaneously operating threads. In the case of Active Server Pages, the client is IIS using an ASP page that has created an object reference of your component via the Server.CreateObject() method. Regardless of how you create your object, Active Server invokes your object on a specific thread and guarantees that it's always called on the same thread or in Microsoftspeak, "the same apartment." Actually, this is not a function of the Active Server client, but of the COM subsystem in Windows that handles the logistics of marshaling requests on your component to the appropriate thread if necessary. If the thread calling your component is already the correct thread, no marshaling takes place. If you create and destroy your object on each page, then marshaling is not an issue, but if you use objects with Session and Application scope, these objects potentially require marshaling. Keep in mind that if you use an application-scope object, a single instance of that object is shared by all simultaneous pages. There's no marshaling in that scenario, but also no multi-threading of any sort. For this reason you should think carefully about whether you really need to implement Application objects – they are very inefficient unless you build a C++ component that can run in the Multi-threaded Apartment (MTA) model. Okay, that all sounds good, but there's a problem in the initial release of Visual FoxPro 6.0. Unlike VFP 5.0, version 6.0 does support apartment model threading, but it blocks access to the same server while another call to that same server is executing. The server is blocked at the component level, which means that the component starts up on a new thread, but has to wait for a blocking lock to clear before it can enter the processing code. This means that if two requests are hitting the page that uses the same COM server (not object, but server—each server can contain multiple objects) the requests will queue. If you have a 10-second request and a 1-second request following it, the 1-second request may have to wait up to 11 seconds to get its result returned. That's very limiting for an Active Server Page on a busy Web server with perhaps hundreds of simultaneous users! This problem has been addressed in SP3 with the multi-threaded runtime and the BUILD MTDLL command (Build Multithreaded DLL from the Project Manager). SP3 and later provides a new multi-threaded runtime that handles thread isolation and does not block simultaneous method calls and it's possible to get unlimited instances of your server to fire up simultaneously. The figure below shows six instances of a component processing simulated slow requests simultaneously. The thread IDs and completion times clearly show that requests run simultaneously. RETURN GetCurrentThreadId() && "waited for " + TRANSFORM(lnSecs) + "..."
Note that you can't use WAIT WINDOW, INKEY or DOEVENTS because these are UI operations that are not allowed in a DLL server. I use the Sleep API to wait without hogging all of the system's CPU in a tight loop. To run this sample, load two instances of the SlowHit.asp page into separate browser windows. Change the timeout values so that one runs for two seconds and one for 10 seconds. Make sure you open multiple, separate browser windows to test any multi-threading samples. If you're using IE, make sure you set the option to have each new instance start up as a separate process (Advanced Options). Once set, click on the Start Menu or Desktop icon to start the new instance—do not use Ctrl-N or New Window from within an existing browser window! Ideally you should use different browsers altogether to simulate multiple clients. Why? ASP tracks sessions by browser and appears to have logic that picks up on this session. When you run multiple requests from the same browser, each server request gets queued to the same thread. If you fire up separate instances, you might still get the same thread occasionally, but if a thread is busy it will start up another for the other session. When you run this demo with the original version of VFP 6.0 or a DLL built with BUILD DLL rather than BUILD MTDLL you'll see that both instances run on different threads, but you'll also find that the two-second request is blocked by the 10-second one. This demo will run for a long time because it has to wait for each of the 10 second requests to run one at a time. Full blocking makes this a serialized request operation. With SP3 or later and BUILD MTDLL, you'll see the two-second request complete before the 15-second one, and you'll see each request on a separate thread. BUILD MTDLL and a new option in the Project Build dialog allow servers to be built this way. The new version of the runtime strips some functionality from the VFP runtime (menu support, reports, old @say..get, and so on) so it is more lightweight, but you might want to check your code to make sure you don't run into some of the missing features. Additionally, Microsoft suggests that the multi-threaded runtime might be slightly slower than the regular runtime because it has to access data using thread-specific local storage, which tends to be slower than direct memory access. Overall this should be a fair tradeoff, though, and the performance difference is expected to be minor. This is the most common scope which creates an object and destroys it all on an individual page hit. This approach scales best. You can create an object and tie it to a Session variable which creates an object that is persistent for a specific user. This is very powerful in terms of keeping state between requests, but it's also very bad for scalability and resource use. Starting with VFP 6 VFP COM objects can be tied to the Application object. Application scope is not recommended unless you have a true multi-threaded component that conforms to the Multi-threaded Apartment model. In this scenario each application variable is tied to a single object that serves all ASP pages and all users. The single instance is serialized and thus only one user at a time can access this object. Not recommended. Once instantiated here, the object can be called on any page that is in the same virtual path hierarchy as the Global.asa file. Understand that this object is global, not only to the current page and user, but to all users on the site! This means a single object instance is held and serialized by ASP, regardless of whether the component is multi-instance-capable or not. For this reason, application-level objects don't scale well unless they are implemented as true multi-threaded and reentrant object classes. This can't be done with high-level tools like Visual FoxPro or Visual Basic, but requires C++, Delphi, Java or any other language that supports true multi-threaded code from within the language itself. In this document I've discussed creating COM objects on the page level, which is the recommended approach for instantiating objects. These objects are scoped to the page, which means they are created and destroyed on each page hit. There's some overhead in this process in terms of performance, but it provides good scalability as objects can run on a single thread that never needs to be marshalled. ASP also locks DLLs into memory with an extra AddRef() call on the COM interface, which means that runtime and support files are never reloaded from disk – object loading occurs mostly from memory and thus fairly fast. Still consider making your Init and Destroy code very efficient to minimize construction and destruction time. As a side note I should mention that this loading process has improved performance dramatically under Windows 2000 compared to Windows NT. So if you're using ASP COM components checking out Windows 2000 should be high on your list. Another option is to use objects and hook them to a user Session object. By doing so it's possible to create an object instance once, and then re-use it later with all of its property settings intact. While this provides persistance (it's a stateful object) this scenario can cause serious problems with resource use as each user will get his/her own copy of the object in question. It's quite possible that thousands of objects could be active at the same time dragging performance of the server down. In addition COM must handle marshalling of the object to the original thread that created the object – this thread can result in blocking while another component may be sharing that same thread and be still busy processing that request. On the whole I highly recommend you only use COM components on the page level. Session and Application objects are limited to a single machine in addition to not providing good scalability, so in a Web farm environment these ASP objects are useless. Page scope is in line with standard stateless programming that should be practiced with Web based applications – state keeping can be easily accomplished in a more scalable manner than the Asp Session object by using application specific database storage. Windows 2000 has introduced a new bug with VFP COM components that causes VFP COM components to randomly crash when more than a single instance of an object is running simultaneously. The problem is especially noticeable with components placed into COM+ applications where just about any simultaneous access can result in a crash of the COM component. This bug is scheduled to be fixed in Vstudio SP5. If you have problems with COM components crashing now you can get a patch from Microsoft Product Support Services (PSS) by calling and describing the problem. Remember that your server always starts in the system directory. If you don't SET PATH TO your application and/or data paths data files and anything else that might be read from disk may not be found causing your server to crash. Stay away from hardcoded paths in your applications because they likely won't match the paths on the server. If you must use paths in any form, make sure you use relative paths or a hard path based on a known path such as cAppStartPath in the examples above. You can also use #DEFINE statements to define paths and a switch to flip between development and online data paths. In order for the COM DLL to get loaded by IIS it must be accessible by the anonymous user account. To execute Read and Execute rights are required. If this is not done ASP will return an error stating that the server could not be created. If you use SQL Server or another server that requires a login make sure you use SQLSetProp(0,"DispLogin",3) to avoid a login dialog from popping up. You have to supply username and password as part of the SQLConnect() code in order for the login to succeed. Remember that your component by default runs under the IUSR_ account, which has few if any security rights. In order to access data on the hard drive this account needs to be given rights to access that data. An alternative is to use the RevertToSelf() API to revert the user to the SYSTEM account, which would allow you access to most resources on the local machine. IUSR_ security is guaranteed to be the issue if you run into any Access Denied errors either via COM or VFP file and data operations. Active Server Pages provide a rich solution for building server-side Web solutions. Microsoft has put its weight behind this scripting technology and has done a good job of providing an easy tool for the job. In addition, through the extensibility of COM, Active Server Pages can grow as the needs of your applications grow. The ability to pass objects between the ASP page and COM components makes it possible to build sophisticated servers that can share data and the base tools from an ASP page. It also gives you the ability to use Visual FoxPro's DML directly for data access, for increased performance of native VFP data access, and the flexibility of the language to perform fast, complex data formatting. FoxPro's strengths with data access speed, the data-centric language and string performance really shine here to give you the best of both worlds. While at first glance it seems easy to get started with the scripting metaphor, keep in mind that complexity and administration go way up once you step beyond the basics. At that point you need to look into extensibility via COM.